We need to make some big infrastructure investments in the UK. The question is which ones, and for what outcomes. Currently the Coalition government seems set to spend £100 billion on replacing Trident. A vast waste of money on anachronistic Cold War technology totally unsuited to the World we now find ourselves in. Let’s scrape it and use the money elsewhere in the economy. Phase One of the HS2 high speed rail link from London to Birmingham looks set to go ahead, at a cost estimated to be between £15.8 and £17.4 billion. The full route up to Manchester and Leeds will cost about £30 billion. Transporting larger numbers of people a bit more quickly between our major cities seems a somewhat limited aspiration, given the cost, and the impact on the local environment. We could do better. The London Array has recently started generating electricity. The first phase, consisting of 175 Siemens 3.6 MW turbines, giving a capacity of 630 MW and costing 2.2 billion Euros or approximately £1.76 billion should be complete within a couple of months. This will make a useful contribution to the UK energy supply at a reasonable cost. A potential infrastructure project with multiple benefits has been promoted by David Weight on the Claverton Energy discussion group, and into which our government should conduct a feasibility study. 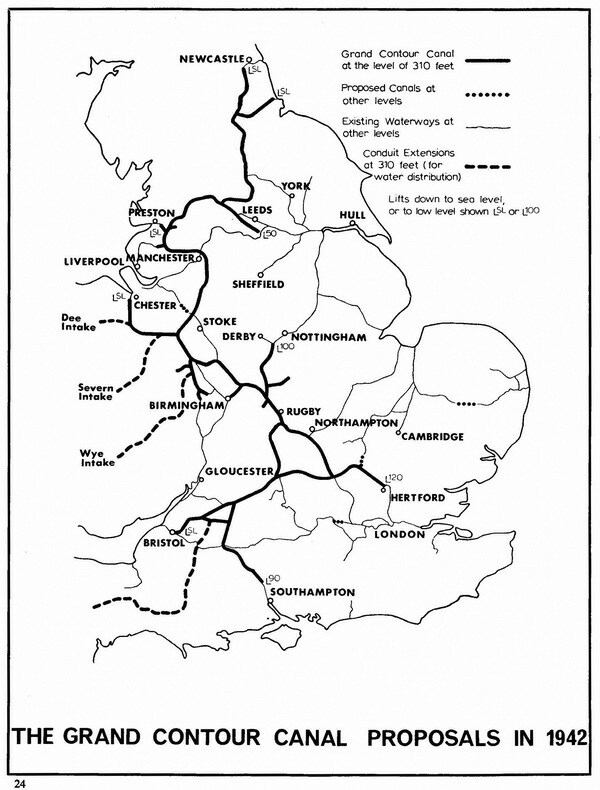 Essentially the plan is to build a large new canal, following the 310ft contour line, as advocated by Pownall in 1942, but extending northwards at least as far as Kielder Water, and preferably into Scotland’s Southern Uplands. The proposal is to bring water from the areas of surplus in Scotland, Northumberland and Wales to the areas of greatest shortage in the southeast of England, for agricultural, industrial and domestic use: very useful as we adapt to a changing climate. The canal would also be used for transport, especially for heavy goods such as timber for biomass, and also for recreational use. The really exciting aspect of the proposal is for it to be used for energy storage and transmission. Water cooled High Voltage Direct Current cables would be laid along the route, bringing the abundant renewable energy from Scotland and Wales to the centres of maximum demand in the major English cities. The canal itself could be used for pumped storage hydro by having subsidiary reservoirs at higher and lower levels along the route, but especially in the Southern Uplands of Scotland. Many existing thermal power stations such as Drax are already located along the route and increasingly using biomass to replace some of their coal consumption. New biomass power stations, fitted with carbon capture and storage, may be located along the route. Surplus heat from all these power stations could be fed into district heating systems and used in intensive greenhouse horticulture. The canal might also be a useful route for fibre optic data transmission, and high energy consumption data centres might be located in the Southern Uplands where the renewable energy potential is most abundant. There would be huge scope for new urban development, and it has been suggested that this planning gain might be used to pay for the whole project. Nature reserves could be strung all along the route maximizing its biodiversity and recreational potential. A cycle path could easily be incorporated. At an estimated cost of between £11.1 and £18.0 billion this could be a very good investment: certainly worth a detailed feasibility study. This entry was posted in Business Investment, Economics, Energy, Food & Farming, Transport on 27 November 2012 by Richard. Congratulations to Barack Obama. His victory is good news for America and for us all. The prospect of a climate change denying, socially regressive President Romney would have been a calamity for humanity. Hurricane Sandy crashing into New York just days before the vote belatedly brought climate change into the campaign, as Suzanne Goldenberg points out in a very interesting article in the Guardian Weekly. Meanwhile much of Europe is leading the World in the Energiewende, to use the German term coined by Angela Merkel, meaning ‘energy transition’, away from an inefficient polluting and fossil fuel based economy to an energy efficient renewables based economy. There are powerful economic arguments to be made as well as the ecological imperative. The cost of mining coal in the USA is going up just as renewables are becoming cheaper: market economics are now on the side of the environment. Bill McKibben and the excellent 350.org folks, along of course with countless others, are working hard to bring Climate Change up the global political agenda, and help bring about an American and a global Energiewende. Obama faces many problems, not least the unsustainable level of debt and high unemployment. Now is the time for the USA to try and catch-up with the best that Europe has to offer in terms of an Energiewende. Obama should raise taxes on the rich, introduce Pigovian pollution taxes and invest heavily in renewable energy and energy efficieny. As Wilkinson and Pickett demonstrate all too claerly in ‘The Spirit Level’ the USA is in danger of becoming such a profoundly unequal society that it becomes terminally socially dysfunctional: so along with investments in the Energiewende need to be massive investments in health, education and a raft of socially progressive measure to help give hope and purpose to America’s dispossessed. 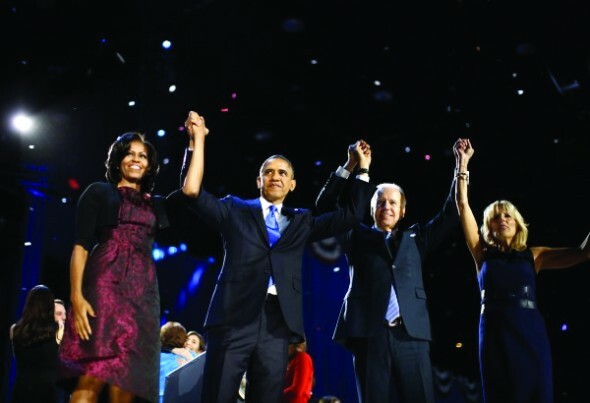 For more on American Debt see this blog from Aug 2011 and for a more of the kind of policies Obama should enact see my Global Wish list from Nov 2011. This entry was posted in Climate Change, Economics, Energy, Politics on 10 November 2012 by Richard.